An article written by Mr. Colin Bangay (Senior Education Adviser for the UK’s Department for International development in India) on 2nd June, 2015 for World Education Blog, prompted me to write about the experiment Door Step School has been conducting for the last four years in primary schools of Pimpri Chinchwad (PCMC) and Pune Municipal Corporation (PMC) schools. Door Step School is an NGO registered in 1989 in Mumbai. It has been working in the field of education in Mumbai since then and in Pune since 1993. All its efforts are entirely geared to creating awareness and opportunities for education; facilitating access to mainstream schools, and imparting education to the most marginalized children in our society. The target group is children between three and fourteen years. Multiple inter-related programs have been developed and implemented to tackle the main problems faced by our public schools viz. non-enrolment, wastage and stagnation. One such program ‘Project Grow with Books’ was initiated in 1999 in only 10 Pune Municipal Corporation (PMC) schools. What started as an ‘extra reading’ initiative for improving reading skills of children in government schools, its metamorphosed version continues to run today in 240 schools in PMC and PCMC area. The program is run on school premises, during school hours with full cooperation of teachers, principals and school authorities. It is scheduled in the school time-table and uses the time allotted for additional reading which is 70 minutes per week per class of about 40 students. ‘Book Fairies’ are grass-root level functionaries who conduct reading class sessions. A team of two book fairies conducts a session. Every session is planned in such a way that every child gets to read a book by himself or herself and also gets to read aloud 5 to 10 lines from that book under the supervision of a ‘Book Fairy’. This takes about 35 minutes of a session time. The remaining thirty five are divided in activities like story-telling, singing action songs, playing word games etc. About 10 minutes of the session time goes in distribution and collection of books. After the 70 minute session is over, children are issued books to take home; they exchange the books in the next session. As a part of this program we take reading ability tests of all children twice a year. The main purpose of these tests is to select books appropriate to reading levels of children. The test results that we got initially were not very different from ASER reports. Year after year we used to find that almost 30% of the 1st Graders were promoted to 2nd Grade even though they did not know all the letters of the Devanagari script - the basic blocks for reading Marathi language. We were not very happy about the situation and decided to act upon it. We went through the steps viz. assess, analyze, and diagnose every year but did not take any remedial action because, as I see it now, our diagnosis was not right. We kept looking at schools and teachers and concluded that poor quality of education or learning is solely because of them. However, we forgot to take into account the role parents play in children’s education. The number of hours and the efforts educated parents in India, (whose children attend good reputed private schools), invest in their children’s education is something to be experienced to believe! The children who attend government schools have to cover the same syllabus, without the kind of inputs and exposure the private school children get from their parents. Also, in addition to regular support and inputs, private school children have a head start because all of them have pre-primary education and some of them even have experience of play-school. Once we examined the problem through this perspective, and accepted it as reality, we started remedial measures. We called this initiative “First Steps Forward”, meaning that 1st Graders who lag behind will step forward and come up to the expected level of 1st Grade before they are promoted to 2nd Grade. Since our main focus is on language and that too, on reading skills, we said that all children in 1st Grade should be able to read a book prescribed for them by the School Board, by the end of the academic year. In terms of learning, it means that all children should be able to read all letters, ‘matras’ (letter + vowel sounds), and composite letter words, without difficulty. We already had Reading Ability Tests designed to measure all these aspects. Since we accepted this diagnosis, we designed a program to substitute parents’ role for the same children. Before sharing how we achieved this goal, I would like to show here how much we could achieve and how we are progressing as we gain more and more experience of running this program. 3. We have a long way to go to achieve our goal! The third point struck us hard in the first year itself. We were aiming to achieve hundred percent but could only cover 50 percent. So we analyzed the data vis-a-vis the children’s attendance and we realized that attendance percentage of a child is an additional factor in diagnosis. Private schools insist on 100 percent attendance. The rules are so strict that no parents dare keep their children at home unless it is an absolute must. In government schools, minimum 80 percent attendance is required. In other words, the goal itself is set at a lower level. In addition, there is no compulsion on parents to explain the reasons for absence. 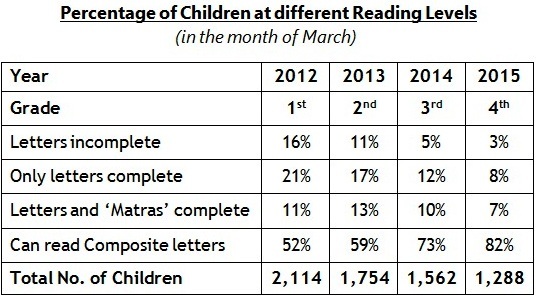 Note: This data is only from 41 schools where we started this initiative in July 2011. The number of children is less because here we only took those children who continued in the same school from Grade 1 to Grade 4. 1. Our specially trained ‘Book Fairies’ work on this initiative with full support and involvement of class teachers. 2. Sessions are for 35 to 45 minutes every day during school hours and in the classroom itself. 3. Yearly planning is done along with every class teacher. Aim is to reinforce what the teacher teaches in the class. This is further broken down in six-monthly, monthly, weekly, and daily planning. School holidays and other contingencies are taken into account while planning. There is a general chart of action. 4. Children vary in their learning capacities as well as learning levels, hence every child’s progress is assessed on a weekly basis while planning for that week. Based on a child’s progress, different activities are planned for each child; and groups are formed according to learning levels. 5. To give reading practice of the letters, ‘matras’ etc. learnt during a week, a variety of teaching aids (teaching material, activities, games, songs, stories, etc.) are used. In fact, we have identified as many as 12 different ways of teaching each letter through play and other creative activities. 6. Ongoing and individualized assessment; analysis, and immediate corrective steps is the Mantra we follow. 7. In addition to the above measures which are school-based, we involve parents, older siblings, and if required, neighbors, in the entire process. We talk about the Right to Education and bring awareness in the community. We discuss with parents what we are trying to achieve. We show them the books, the content, and explain what we expect from them and how they can facilitate the process even if they are not literate. We provide them with charts, pictures, etc. to be put on their walls. These are based on our weekly planning. Elder siblings are also involved in the same manner. Throughout the year, we are in contact with parents. 8. We plan to work on improving attendance more rigorously from this year. Initially when we started the program, the percentage of children who had 80 percent or more attendance was around 40 percent of total enrolment, but slowly and steadily now it has gone up to 52 percent. 9. It is important to note here that last year, the local government education department requested us to organize training for 103 First Grade teachers from municipal schools where we are working. The training was mainly for making and using simple but engaging teaching aids from easily available reusable material. All these aids are regularly used by our Book Fairies in the classroom. We know this is just the start. ‘First Steps Forward’ is a small initiative in the much larger picture of ensuring learning in school. But we see a ray of hope - enhanced awareness in the communities, partnered with more learning opportunities, innovative teaching approaches, and regular remedial action - this initiative will definitely lead to better learning outcomes. Great post. Its really very good work. Thanks for sharing.